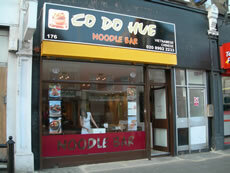 The newest arrival on the Acton High Street scene is Co Do Hue Noodle Bar. Three of us decided that it was time to expand our options (and possibly our waistlines) and paid it a visit. 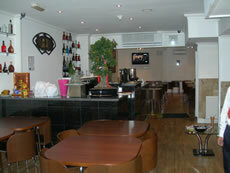 The noodle bar has definitely been given a make-over. It looks very like a wannabe Wagamama with its cool white walls. There's nothing much to make you feel at home here, apart from the charming staff. If - like us - you are shown into the back room where the small tables are crammed together next to a huge video screen showing snooker, you will spend the evening wishing you had a view of the George and Dragon. But there are lots of attractive and amusing artefacts in the front section. So without anything apart from the snooker to distract us from the job in hand, we set about examining our menus. We started with Chicken Satay, Vietnamese Spring Rolls and Grilled Dumplings. The Satay was ok, but its peanut sauce a little greasy and not very interesting in the flavour department. Dumplings arrived with their dipping sauce, as did the spring rolls which unfortunately tasted of the deep fat they had been fried in and not much else. The dumplings were plump and filled with minced pork and were perfectly ordinary. I was a bit underwhelmed by the starters, but that's not to say that there was a scrap left. My companions told me I was being fussy. Main courses were accompanied by something called Egg Fired Rice which is just a typo, and there was nothing remarkable about this particular version apart from its colour which was yellower than you would normally expect. Mongolian Lamb wasn't my choice, but it turned out to be quite nice: the lamb sliced and steeped in a medium-fiery sauce. We also tried Duck Chow Mein, Chicken with Lemon Grass and Sizzling King Prawn with Ginger and Spring Onion. These were was all perfectly edible but with no discernable fresh spices having been used. The King Prawn was probably the best of the bunch. After this, I would have awarded Co Do Hue 5.5/10. It was all ok but nothing special. So we decided to try a take-away, too after a respectable couple of weeks later. This was not a success. The quantities were off-puttingly copious with enough prawn crackers to feed an army. The vegetarian spring rolls were much more successful than their Vietnamese counterparts. One teenager commented: "for something vegetarian they taste quite meaty", which is a compliment. We then tried Crispy Aromatic Duck which came with the usual pancakes (each group of eight in a cellophane bag), plum sauce and sliced cucumber and spring onion. The duck had already been chopped up and consisted of an awful lot of the outside crispy bits and not that much meat. It was definitely not the best I've had, but not the worst. However, our two large tubs (why so much?) of Fried Aubergine Salmon with Hue Sauce were mostly thrown in the green bin - the aubergine had indeed been fried, but not in anything nice, the fish would have been nicer if it hadn't been swamped in the tasteless sauce and someone seemed to have tipped in a mixed bag of veg somewhere along the line. The lamb didn't taste even quite nice as before and Chicken with Bamboo shoots was swimming in a glutinous, unappetising sauce which did it no favours. Beef Chow Mein was too salty. I think 3.5/10 for the take-away. I really can't recommend this as a take-away experience as it's not one I want to repeat. I'm sorry but nothing tastes freshly cooked and there is no attempt to get away from tasteless, glutinous or oily sauces. In fact, I think take-aways are a swiz as I always end up washing up loads of plastic or foil containers and feeling guilty about the environment. Rant over. Anyway, if you want a cheap noodle experience, give it a try. Our eat-in meal for three plus two beers and a diet coke came to £37.90 excluding service.